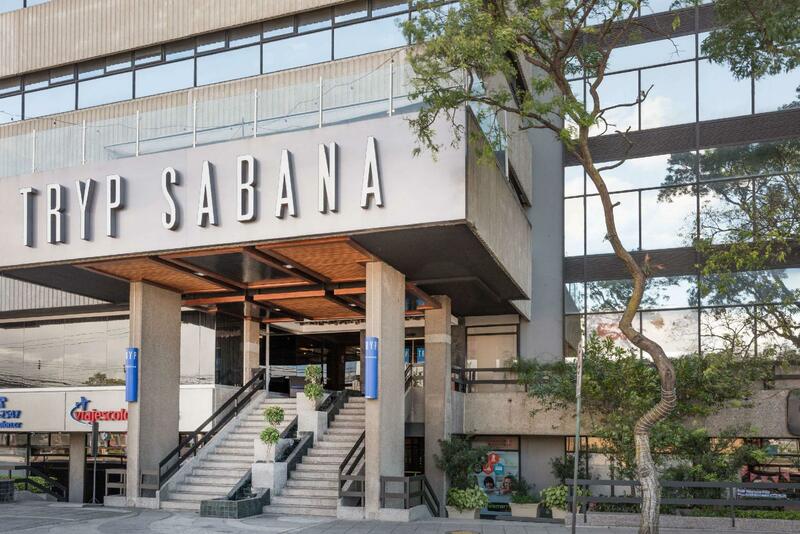 ﻿ Book TRYP by Wyndham San Jose Sabana (Costa Rica) - 2019 PRICES FROM A$113! Have a question for TRYP by Wyndham San Jose Sabana? Well-positioned in Merced, TRYP San Jose Sabana Hotel is the ideal point of departure for your excursions in San Jose. Only 10 km away, this 4-star hotel can be easily accessed from the airport. Also within easy reach are Galeria Ocelote, Jeannina Blanco Fine Art, Esmeraldas and Disenos Jewelry. 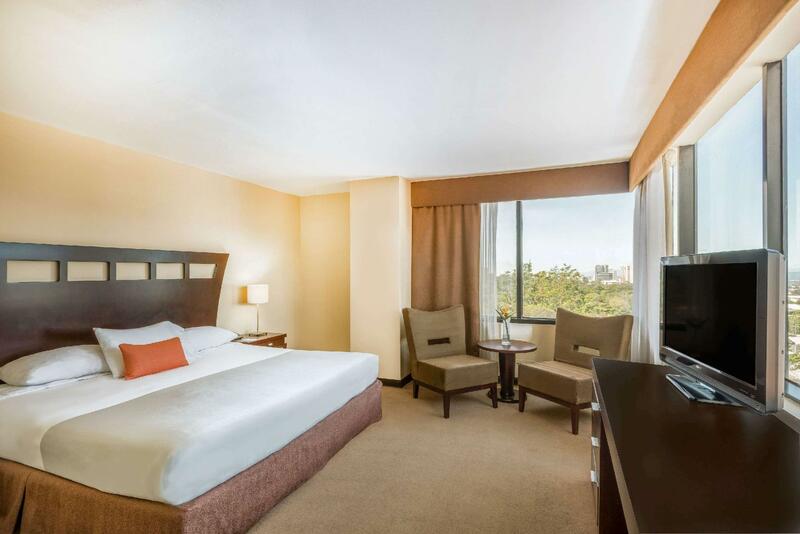 Offering hotel guests superior services and a broad range of amenities, TRYP San Jose Sabana Hotel is committed to ensuring that your stay is as comfortable as possible. Top features of the hotel include free Wi-Fi in all rooms, facilities for disabled guests, Wi-Fi in public areas, car park, room service. 98 rooms spread over 9 floors provide a warm and pleasant home away from home. 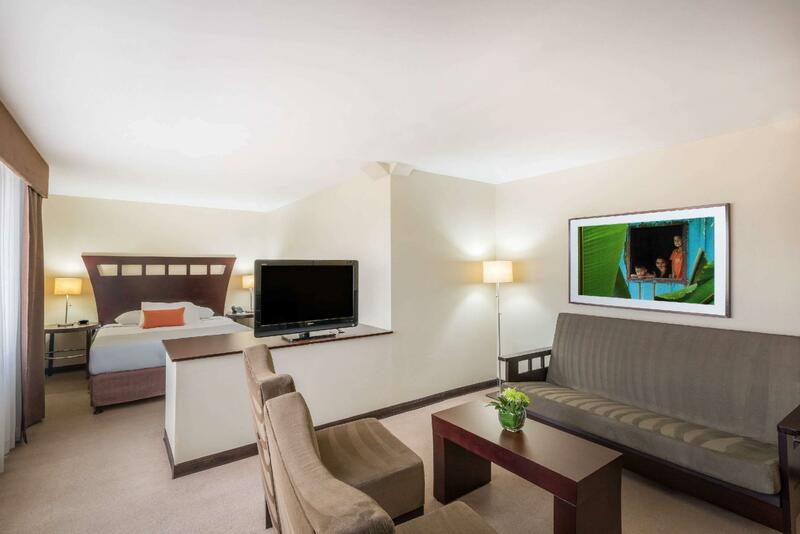 Modern comforts such as television LCD/plasma screen, carpeting, internet access – wireless, internet access – wireless (complimentary), non smoking rooms can be found in selected rooms. Whether you're a fitness enthusiast or are just looking for a way to unwind after a hard day, you will be entertained by top-class recreational facilities such as fitness center. 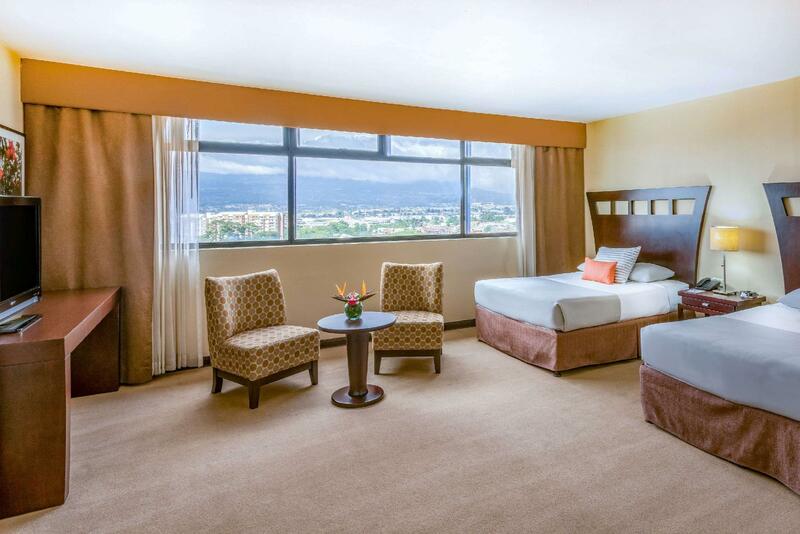 TRYP San Jose Sabana Hotel is your one-stop destination for quality hotel accommodations in San Jose. I arrived early and was delighted to find that I could check in early. The hotel features lots of contemporary artworks - by local artists, I think. The room (606) looked out over the city and I could also see some of the Independence Day parade from my room. There is a small gym on the fourth floor and the breakfasts were good. My only complaint is that there was no desk light - room lighting is quite dim so a small desk light would make a huge difference. 4 stars hotel with the service of 2 star, staff very unprofessional and rude ... not at all the hospitality of Central America but worst then Europe, But location is kind of good , like 20 m walking to the center, I will not recommend this hotel to other tourist for pleasure at all, is possible to finde better and less expensive. large room, close to some resturants. Really enjoyed our stay. We had dinner in the hotel and the food and service were great. Super comfortable beds. The desk clerks speak English, dining room has great ambiance and offer breakfast Buffett for free, room is clean and pillows are so comfortable, free long distance and wifi. Our stay in the hotel was pleasant. If you choose to stay in the city, this hotel offers more. They offer an excellent breakfast buffett in the nice ambiance dining room. Overall, the hotel is clean and safe. The hotel desk clerks are available 24 hours a day. There are many restaurants around the hotel surroundings if you choose to eat outside the hotel. The room is clean daily and the toiletries are supplied daily. The Wifi is free and fast. You can also use their business center which is available 24 hours. This is the only hotel that I have seen that offers free international long distance at no additional cost. The bed and pillows are very comfortable. I will go back to this hotel when I return to this city. My last stop before leaving the country. I needed somewhere to empty out my luggage and a place where I could relax and unwind from a long trip. My first impression was the hotel was good. The front desk concierge was not very welcoming and not very knowledgeable of the city. We were looking to take a tour of Irazu Volcano and asked the concierge to book it. He assured us that it was a done deal. After dinner we approached him for our confirmation and he said that the tour was all full. HOURS went by and he never told us that. We were unable to book anything by that point. Wish he would have been more proactive with us. The room was large, but the beds were full size and not queen, so sleeping 4 people was quite cramped. I would recommend this hotel if you're in town for business or if you are passing through for a day. The was one of the most enjoyable hotels. The staff was very good in ensuring you stay was enjoyable. The hotel also provided free local and long distance calls. The hotel does provide airport service for a fee. Stayed here for one night as we had a flight early next morning - we were three people sharing one room, one TINY room!! For 2 people it would have been fine, but three adults it was very tight, but doable for one night. The location of the hotel is also very convenient with many restaurants in close proximity and the airport only 20 minutes by car. My girlfriend and I stayed here after 5 days in Tamarindo. I read reviews and had heard good things but did not know what to expect. How happy I was that I booked at TRYP! Staff was attentive and friendly. Hotel location was relatively off the beaten path so there was no excess noise on a Friday night. The room was HUGE! Room service was good (but not billable to my room for some reason). International calls were free and so was the WIFI which was fast. Breakfast buffet was very good with a lot of options and went until 10AM. Checkout was at noon. The only critique I have is that an airport shuttle was not included in the price of the room. The front desk staff called us a cab for a charge of $27.00 US dollars and we made it to the airport quickly and with plenty of time to make our flight. All in all, a great experience all around! Lovely big room, really comfortable with a big bathroom. Room service was good. The shower was nice, but took a little while to heat up at the beginning. Overall was incredibly happy with my stay... I will stay there again, but definitely for longer next time - my stay was too short! we stayed here with two young kids and found it to be a very nice hotel. friendly and helpful staff, good rooms and a good restaurant on the premises . if one would like to eat elsewhere there are plenty of restaurants and a supermarket across the road. also very convenient for car hire as all the main companies are around the corner. the main shopping streets are a 15 min walk or so away.